The benefits of off-site manufacturing are becoming more well-known across industry particularly with the construction sector under increasing scrutiny to deliver a significant number of homes while facing a skills shortage. Packaged plants containing the likes of boiler rooms or combined heat and power (CHP) plants, utility cupboards, and in some cases complete energy centres, are built to a pre-determined specification and schedule and are delivered to site ready to install. This brings with it a number of benefits, including assured product quality, established upfront costs and reduced time and wastage on site. Government in particular has cited off-site manufacturing and digital construction as being key to the transformation of the construction sector’s productivity and last year announced a £450 million investment in these methods to deliver a 50% reduction in the time taken to deliver new builds . Prefabricated solutions are often constructed in dedicated build facilities meaning a large number of cupboards can be built to agreed design and specification to meet tight timescales on projects. With strict quality assurance procedures in place, this approach ensures that the standard of units is extremely high, particularly for pipework and wiring which would ordinarily be carried out on site. What’s more, all utilities are installed in the same location, providing benefits for maintenance staff and offering a clean and premium finish for end users. Prefabricated solutions align well with the considerations of building service professionals who are tasked with ensuring that new building services work well with existing building components. Additional considerations include guaranteeing reliable access to building services for installation and maintenance, minimising resource consumption and reducing the environmental impact of the fabrication, construction and operation of buildings. The installation of heating and plumbing services usually requires specialist skills from qualified HVAC professionals. However, with a pre-assembled solution, this is already taken care of. 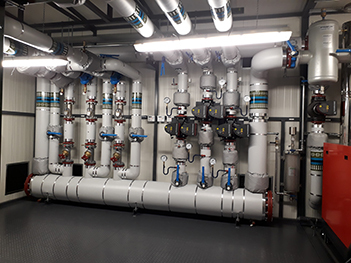 For example, a prefabricated boiler room may include gas-fired boilers, primary and secondary pumps, pressurisation and dosing equipment, heat exchangers, an air and dirt separation plant, and fully insulated pipework and headers. According to the Committee on Climate Change, heat networks are expected to deliver up to 18% of UK heating demand by 2030 . For any district heating project, there are key considerations that need to be made, with one key area being well-planned design and construction to ensure they operate efficiently and are providing tangible benefits for end-users. Given the need for prefabricated solutions to also take on these considerations, there is significant opportunity for heat interface unit (HIU) utility cupboards. HIU utility cupboards are ideal for large residential multi-occupancy properties to efficiently meet heating and hot water demand. Cupboards like these come complete with HVAC products pre-installed including HIUs, comfort cooling units, and underfloor heating or radiator capability. 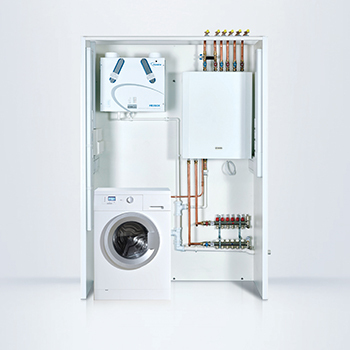 What’s more, any associated piping and electrical are already installed and additional capacity for a washing machine is available, making it a simple ‘plug and play’ option. There has been a lot of focus on the housing market in recent years, especially following the government’s target of delivering 300,000 new homes per year until 2020. Off-site construction is expected to boost the productivity of the construction sector in order to meet this demand. However, with these ambitious housing targets comes an expectation for buildings to constructed at a faster pace than ever before. Thankfully, off-site construction allows for properties to be built up to 30% more quickly than using other methods, and in some cases can reduce costs by more than 25%. For example, installation time is greatly reduced due to the modular design and first-fix options. In addition, human error on site is minimised meaning time is used effectively and labour costs are reduced significantly. As new build property design becomes more minimalist and with residential space at a premium, building services must be contained within ever smaller spaces. It’s in these scenarios where prefabricated plant solutions which are functional, compact and meet requirements efficiently and effectively, are becoming ever more popular to save valuable space and provide standardisation across developments. Building information modelling (BIM) is the process of managing assets within the built environment via a digital platform to give insight into the cost and lifecycle of a building. It is already playing a significant role in helping to deliver construction projects as efficiently and accurately as possible by ensuring that any potential issues of a project are identified and resolved before any construction takes place. Uptake of this concept is ever-increasing in the UK which has had a minimum requirement for using Level 2 BIM on centrally-procured public projects since April 2016. Modular methods of construction, such as prefabricated units, are optimised for BIM and when used together allow for the ultimate efficient, sustainable and cost-effective solution. While packaged plant solutions no doubt provide a significant opportunity to increase productivity and minimise risk on a project, collaboration and planning are key to this success and are almost of more importance here than on standard projects. It isn’t unusual for changes to building design and services to take place on site where obstacles are presenting a challenge and need to be overcome. However, with prefabricated units, last-minute adjustments cannot be made once they have been delivered to site. Therefore, a considerable amount of time must be spent planning the design and specification of these solutions in the pre-construction phase of projects. Furthermore, logistics must be considered to ensure the fully designed solution can be delivered to site and moved into place effortlessly. One of the best ways to ensure the process runs as smoothly as possible is to visualise the prefabricated solution in person rather than simply through drawings, to get an idea of dimensions and weight using full sized mock-ups. With modular methods of construction and pre-assembly techniques going hand-in-hand with quality and productivity, the UK construction industry is presented with an innovative and efficient solution to meeting housing targets and ensuring projects are delivered accurately and efficiently. Of course, not all projects are the same and a standard prefabricated solution may not work in all properties. As such, HIU utility cupboards are available as either a standardised option for simple projects but can also be built bespoke to specific design requirements.